Kids these days have got it too easy. It’s about time they had to put up with some work to get what they want. Next time the little’uns get an inklin’ to raid the cookie jar, they’ll have to earn it. Back in my day I had to walk uphill both ways to get to the cookie jar. The Cookie Cutters-in-a-Jar makes me smile in grumpy old man delight, secure in the knowledge that the kids will spend less time on my lawn, and more time learning that there is no such thing as a free lunch (or cookie). 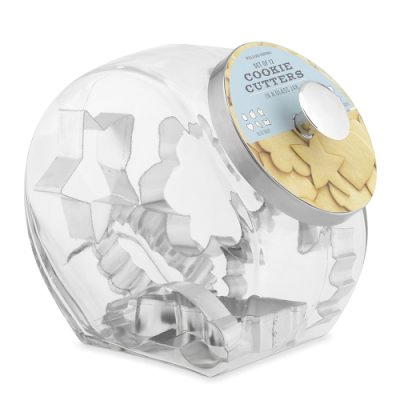 Equipped with a jar for storage, these cookie cutters in a dozen fun shapes provide for creative cookie baking year-round. Shapes include leaf, apple, car, ice cream cone, fluted circle, cupcake, house, heart, train, daisy, tulip and star. Tin-plated steel. Hand-wash and dry thoroughly. 2″-4″ wide. Set of 12. Looks like the above link is sold out, but I found a similar item up at Amazon — which for some reason costs about $50! So, while those kids are not getting off my lawn, they better be cutting it, because it’s gonna take a lot of chores to earn these cookie cutters!